A number of serious abuses that victimize the As­syrian people are underway in their homeland but are not widely known among those in the inter­national community who have a concern for the welfare of minorities in Iraq. 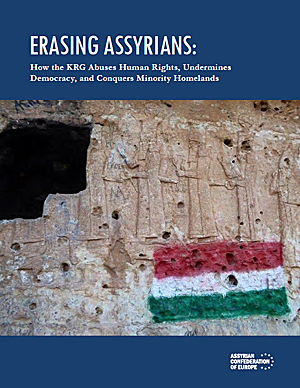 This report endeav­ors to raise awareness about these human rights violations and about the political dynamics that seek to deliberately undermine Assyrian efforts to develop a stable framework of local administra­tion and security in the Nineveh Plain. This report conveys and contextualizes findings made by a representative of the Assyrian Confed­eration of Europe (ACE) during a research trip to Iraq in December 2016 and January 2017, in ad­dition to data gathered on an ongoing basis from a wide range of members from many Assyrian communities in Iraq. It seeks to convey a detailed understanding of the current situation facing Assyrians in northern Iraq. ACE has interviewed approximately 100 men and women of Assyrian communities in the Kurdistan Region and the Nineveh Plain. In addition, ACE continues to conduct follow-up telephone inter­views. All individuals interviewed were informed of the purpose of the interview, and verbally consented to the use of information provided in this report. Names and identifying information of many interviewees have been withheld in the interest of their personal safety.